Are you interested in adopting, or may be interested in the future? 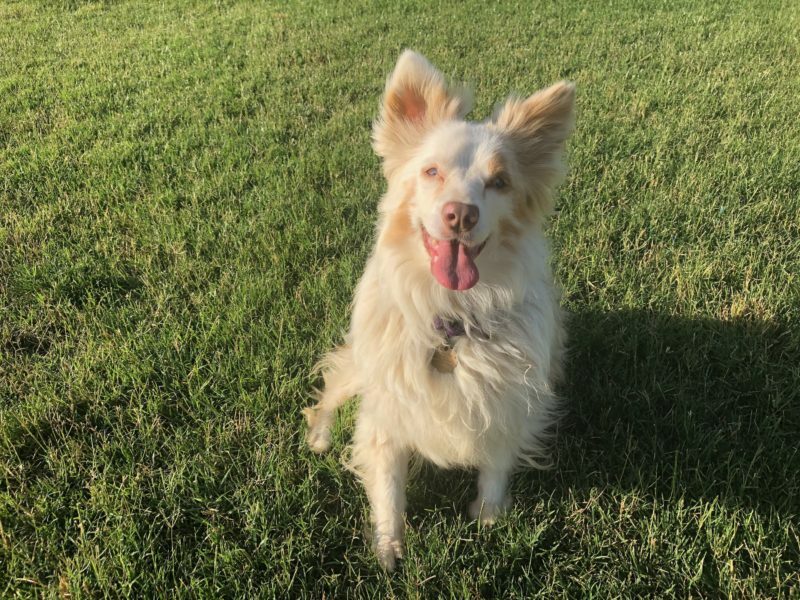 Please fill out this application online.To see adoptable dogs of our friends, Aussie Rescue SoCal, click here.To view dogs available at our local San Diego shelters, click here.To sponsor one of our adoptable dogs, click below. Very friendly with people. Not recommended for young kids or dog park lifestyle. Unknown with cats. So far, he has been friendly with other dogs at his foster home and loves to play with toys. He loves to play and run — a secure dog friendly yard is a must. Bryce can be startled by sharp loud noises. A quiet environment is best. He will need someone who is home more often than not and has lots of time to interact with him. 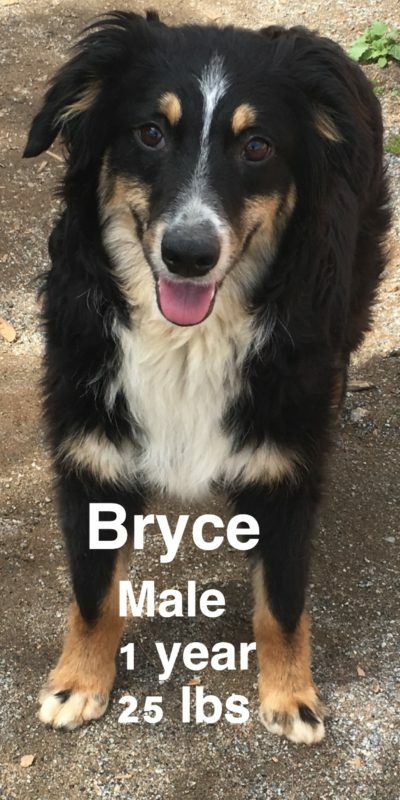 Previously rescued from commercial breeding industry, Bryce will need patience and guidance as he learns to acclimate to the real world. Jewell was at a local shelter where she was so shut down, staff members had to carry her when moving her. She was very sick with pyometra, scabies, skin infection and more. They took excellent care of her and we rescued her as soon as we had an open spot. Jewell has come a long way! She is now healthy, has a gorgeous coat and sweet adoring eye. She is still very shy with new people but usually will take food. Jewell has learned to walk on a leash but still needs coaxing in new situations. Jewell has been great with her foster dog siblings and is very easy to live with. 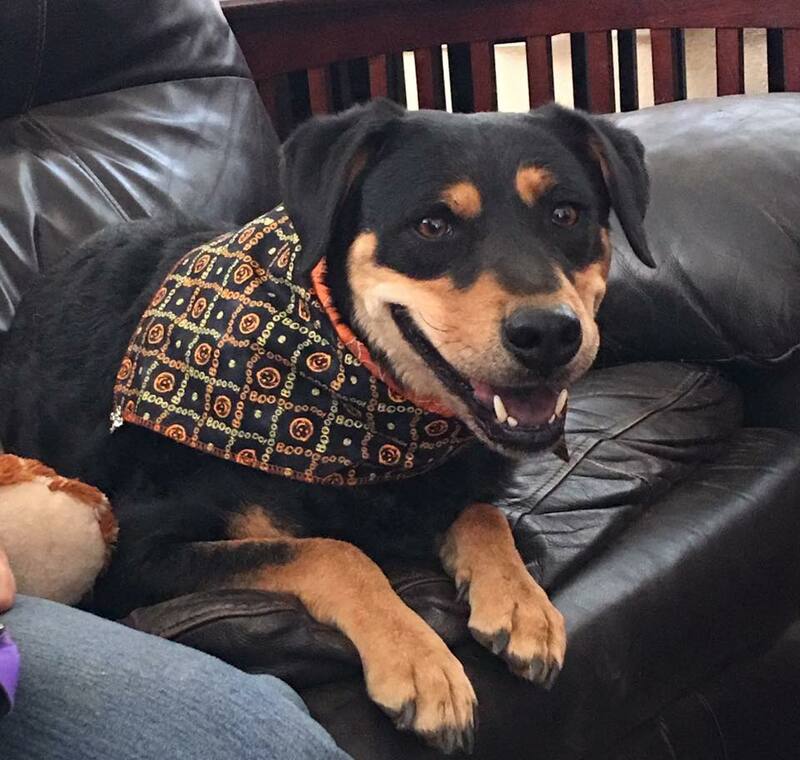 If you would like to give a shy dog a chance and think you want to adopt Jewell, please fill out our adoption application http://aussierescuesandiego.org/foster-and-volunteer/adoptionapplication/. Please answer every question even if with “n/a” or it will not submit. We will respond to your application within 24 hours. If you do not hear from us, email us at info@aussierescuesandiego.org. Oaks is a 1 year old neutered male who is up-to-date on all his shots and takes his flea prevention medicine monthly. He weighs about 50 lbs. He loves to be cuddled, given attention, and thinks of himself as a lapdog! Inside the home, he is well behaved—he is housed trained and will let you know if he needs to go “potty.” He will whine, stand, pace back & forth to the backyard door. He is also kennel trained. Oaks needs to get social behavior training. When out on walks, he will bark at people and other dogs. He doesn’t take nicely to new faces and will bark and try to “nip” at them unless treats are presented to him and he’ll come down. Needs to be in a household with no kids and to be the only dog/pet. 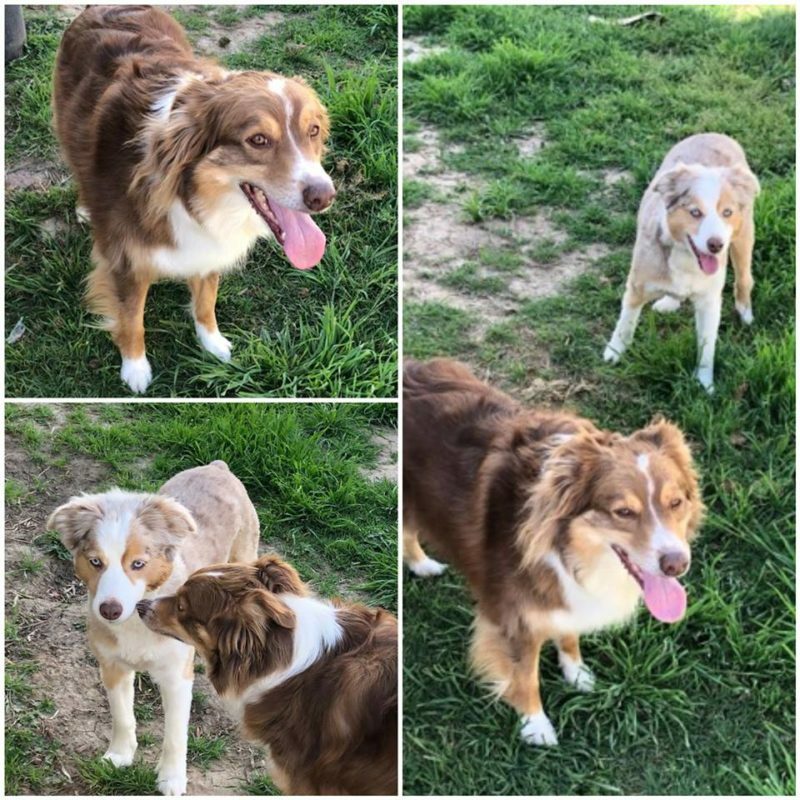 Sara is a red merle spayed female (40 pounds) and Joseph is a red tri neutered male (38 pounds), both are 6 yrs old and although they are not littermates, they have been together their whole lives and are best friends, so are needing a home together. 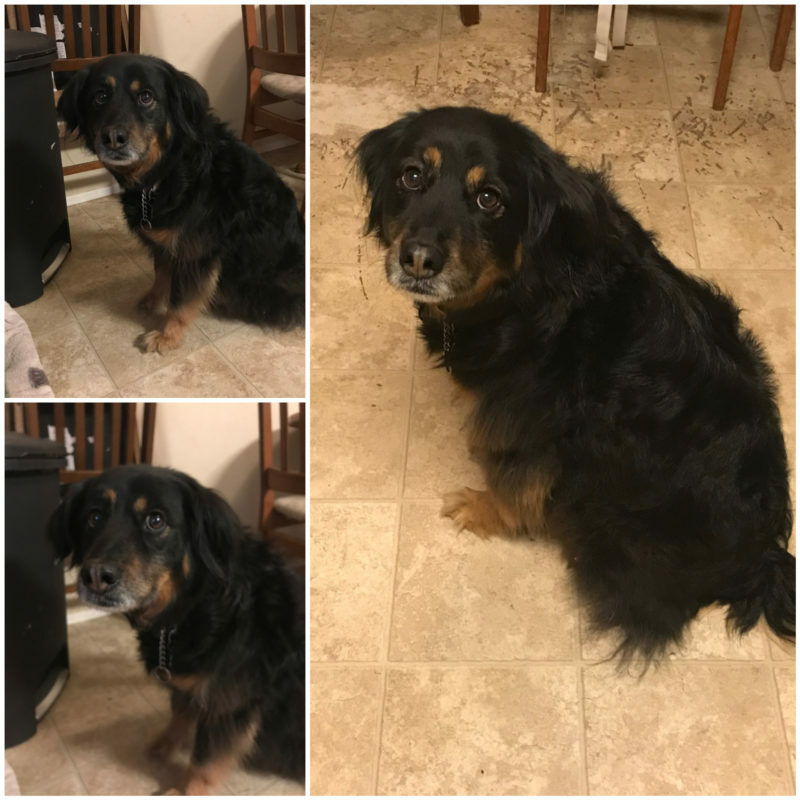 They are housebroken and well behaved in the house, used to going to the groomer (Sara has been shaved down), may have the normal reserve at first but friendly and affectionate once they know you, have been okay with kids but do not live with any. No idea on cats and have not been socialized with other dogs, so do bark at them when they see them on walks. 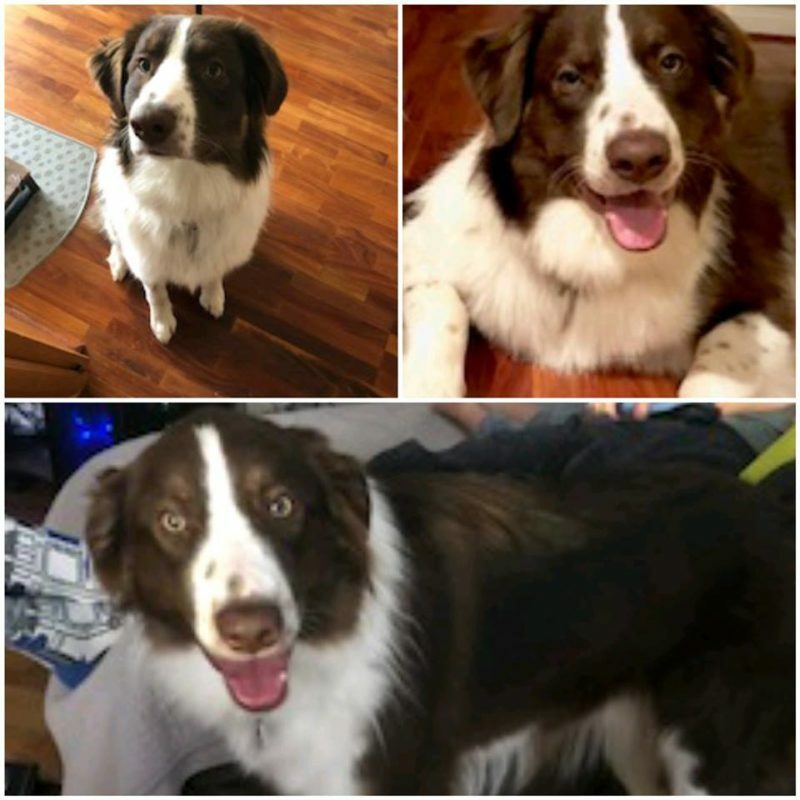 They are energetic and playful and used to a large fenced back yard to run and play in all day. Sara is very sweet and calm, Joseph is more excitable and may jump up on you—he needs a bit more training—but does calm down after a bit. They are fed a raw dry food and currently have a 2 month supply—whatever is left when adopted, will go with them. They have been very well loved and cared for, but due to illness, their owner is having to rehome them. Kobe is a 7.5 year old, 70lbs bundle of joy that thinks he’s a lap dog. We’ve had him since he was 8 weeks old. Kobe loves to be around his people and thinks he’s a human himself! Definitely an indoor dog that is trained to go outside to got potty and do his business. If you lock him out of your house beware that he will do anything to get in!!! He wants to be with you, but that doesn’t mean you can’t leave him for hours or even a day as long as he can get inside “his” home. Yes very spoiled!! Kobe also knows how to do a few tricks for treats, such as sit, down, roll over, high five, stay and play dead… Sometimes he’s lazy about doing them lol. 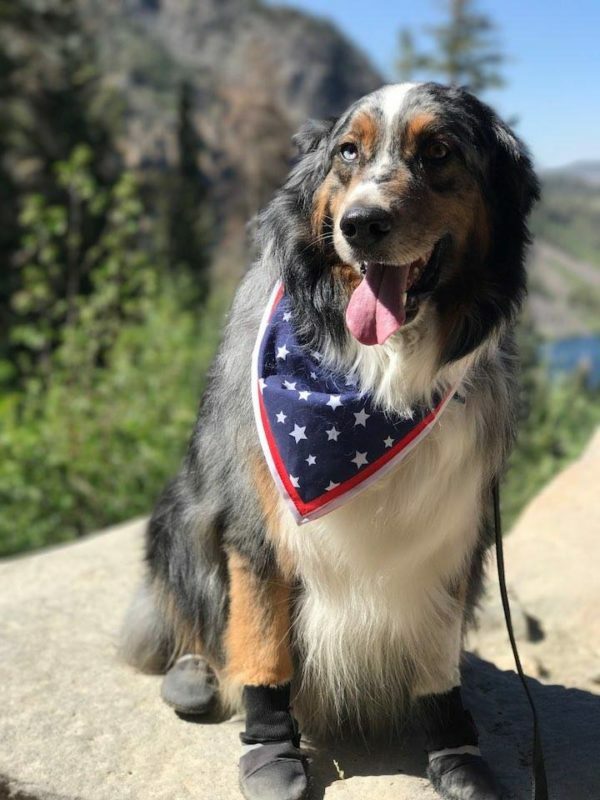 He loves camping! Walks and runs. COURTESY POST—Contact Tinkertots1@yahoo.com for information. Riley is 8 years old (almost 9). She is potty trained, was crate trained, and went through obedience courses. She loves walks (long or short), is pretty good about not pulling on the leash (except when there’s another dog). She is an indoor/outdoor dog, sleeps indoors at night (mostly in her dog bed). She loves just to be near you even if you’re working on the computer or sitting on the couch. She does get scared of thunder and fireworks, but otherwise, isn’t scared of much. She is protective of you when walking and especially when people come to the house. As soon as she knows your visitor isn’t a threat, she just wants to lick you and get a nice pet behind her ears. The biggest reason for seeking a new home for her is that she has nipped at all of the children in her family over the years. While her response was provoked by little toddlers, owners want to see her go to a home where she can have undivided attention and love. She’s not an overly loving dog for small kids and prefers to be left alone, especially by 1 year olds. She also doesn’t love other dogs that much. When dogs walk by or you go on a walk with her on the leash, she does bark and lunge at other dogs. She is small enough that it’s totally manageable. She has had regular physicals over the years. At times, she does limp a bit if the weather is cold or she’s been running around a lot, but it doesn’t last long. She’s up to date on all her vaccinations too. Ideally, Riley would go to a home where she is the only dog, there aren’t small children, and she can gets oodles of love, petting, and walks.